Pat Robertson: Surely His Colleagues at Regent University Have to Groan! Pat Robertson has voiced his opposition to the Bible’s history in Genesis once again, by personally attacking young-earth creationists with name calling. In a recent episode of CBN’s 700 Club, Robertson claims, “The truth is, you have to be deaf, dumb, and blind to think that this earth that we live in only has 6,000 years of existence.” You can view the clip from Tuesday of this week below or on the CBN website, beginning at 37:50 to 40:56. Robertson thinks that oil comes from the Jurassic period (from dinosaurs), and he thinks that the Jurassic period was 65 million years ago. But, secularists actually state that oil was formed primarily from algae and plant materials (not animals like dinosaurs) throughout the Paleozoic, Mesozoic, and Cenozoic eras from 542 million years ago to essentially the present. Secular dating of the Jurassic period is 201–145 million years ago. After that is the Cretaceous period, conventionally ending 65 million years ago. The point is, Robertson doesn’t understand what the secularists teach—and yet is so quick to mock Christians who believe God’s Word. Robertson stated that the solar day is how long it takes the sun to orbit the galaxy! But the solar day is actually the rotation period of the earth with respect to the sun. What Robertson stated concerning the “galactic day” was nonsense. There is no such day recognized as a galactic day. Robertson clearly doesn’t understand dating methods, as he equates radiocarbon dating with millions of years. You see, radiocarbon dating has nothing to do with millions of years—he’s using the wrong dating method to even discuss millions of years. There was a point of time after the earth was created, after these things were done, after the universe was formed, after the asteroid hit the earth and wiped out the dinosaurs, and after all that there was a point of time that, there was a particular human being that God touched. And that was the human that started the race that we are now part of. I think prior to that who knows what was here. He appears to be saying there were other human beings before Adam, but only one that “God touched" who started the human race. But in 1 Corinthians 15:45 we are told Adam was the “first man.” There were no other men before him. To believe otherwise is to believe that the Apostle Paul (and therefore God) made a mistake or lied in 1 Corinthians. Robertson also claims, “There’s no way that all you have here took place in 6,000 years. It just couldn’t have been done. It couldn’t possibly have been done.” So, there is no way God, the infinite Creator, could not have created the universe in six days just 6,000 years ago? God could have created everything in six seconds if He wanted to. It’s not a matter of what man thinks—it’s a matter of what God clearly says in His infallible Word. Pat Robertson’s remarks illustrate one of the biggest problems we have today in the church—people who compromise the Word of God with the pagan ideas of fallible men. That’s why a big part of the AiG ministry is to call the church and culture back to the authority of the Word. In response to Robertson’s unbiblical claims, for the next three days, we are giving away a free download of my recent video Stop Trusting Man’s Word. And frankly, I don’t think the title could be more appropriate. You can download this video free until Sunday night (normally $12.99 on DVD). Share this with your friends and encourage them to download and view Stop Trusting Man’s Word too! I think you’ll find a whole new level of confidence in the truth of the Bible! The code “TRUSTING” for a free video download of Stop Trusting Man’s Word is active through Sunday, May 18. Here is a link to the video download product page, and you can have it automatically added to your cart with the code already applied at this link. Choose the Downloads option from the menu. The file should immediately start downloading and show its status in a download dialog box. I believe Robertson’s remarks (and he has made similar remarks in the past) also illustrate a problem humans have had since Genesis 3. As a result of the fall, humans have a sin nature. This means we are more likely to accept that which is wrong than that which is right. Our nature is that we would rather trust man’s fallible word than God’s infallible Word. Robertson illustrates this by the fact he doesn’t even have his information correct concerning what secularists believe, and he uses this incorrect information to blast those who take God at His Word. This shows that he doesn’t know why he rejects a literal Genesis—he rejects it and then uses all sorts of mixed up wrong ideas to justify his rejection! What a mess! What a travesty! If we say we believe in the Bible’s inerrancy and authority, we must place our faith in Jesus and respect His written Word, beginning in Genesis! Of course, scientific evidence over and over again confirms that the Bible is true, and our PhD scientists at AiG have written hundreds and hundreds of articles and books that affirm this, but on those matters that sound impossible to fallible man—whether it be God creating in six actual days or a virgin maiden giving birth—we must place our faith in what the infinite Creator God says, not finite man! 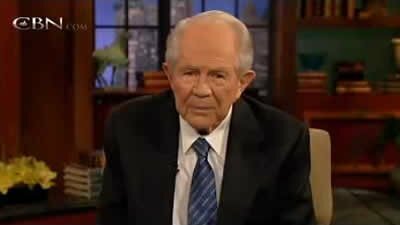 I wonder if Pat Robertson would be prepared to discuss these issues with me or one of our AiG scientists on the 700 Club? Or maybe in some sort of debate format at Regent University? We are certainly willing to do that—maybe all of you reading this could challenge CBN/Regent University to allow such a discussion, debate, or forum to occur publicly. I wonder if Pat Robertson, who is allowed to state these things so publicly through CBN will agree to have his statements publicly challenged and tested! Again, I urge you to take advantage of the free video download of Stop Trusting Man’s Word. And please consider bringing your friends and family to the Creation Museum so they can learn the truth about God’s Word. And this year, kids 12 and under are free (with one paying adult). Help overcome the false teaching by Pat Robertson on Genesis and come to a facility that honors God’s Word and teaches the gospel daily. Previous Article Baseball Players at the Creation Museum Next Article Something Big Is Almost Here!